The basic principle here is that, in games, the level of reward provided by an action should match the level of risk it entails. Low-risk behavior should generally provide low rewards. A highly rewarding action (say a high-damage attack or a high-value treasure) should require a commiserate level of risk otherwise players will never have a reason to choose a lower-reward alternative. Using Risk-Reward as a lens, you can see this relationship at various levels of game design, from weapon balance to level design. Consider the classic relationship between light attacks and fierce attacks in the Street Fighter series. Fierce attacks do significantly more damage on a hit but, due to their long recovery animations, leave the player vulnerable if they miss. On the other hand, light attacks do little damage on a successful hit but provide a nearly non-existent window for counter-attack should they miss. You can also see Risk-Reward at work in level design in the Mario series. A particularly clear example of this how red coins are used in Super Mario 64. In every level, there are 8 red coins that the player could collect for an extra star (the reach goal of the game being to collect all 120 stars). Red coins are often placed near the main course of a stage but in locations that are harder to reach than normal, say a small platform that the player would need to jump carefully in order to reach. Here, the player is presented with a choice: risk losing a life to get the red coin or play it safe and give up on collecting all 8 red coins and earning an extra star. A key in the red coin example is that the reward has to be significant enough to justify the risk while not being absolutely vital to proceeding in the game. Had the red coins been required to finish the game, precariously placed red coins would have gone from being an optional risk to being a difficulty spike that could cause players to quit the game out of frustration. Nowadays, it’s almost a given that players expect to be able to finish any game they play. This doesn’t mean that they expect to clear every possible challenge a game presents, just that they can beat it at a “normal” level of difficulty. What this implies that clearing a game does not present a significant enough of a reward to justify higher-than-normal risk. This isn’t to say that a game has to be easy, it’s that the difficulty of required actions shouldn’t deviate too far from the average difficulty of the game at that point. 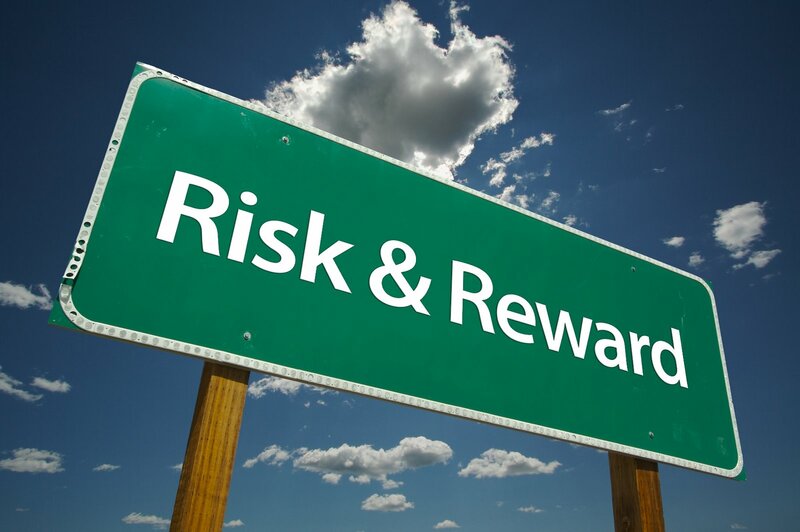 Applied to Risk-Reward this suggests that risk of a particular action should be calculated relative to the risk of other actions available at the same time.